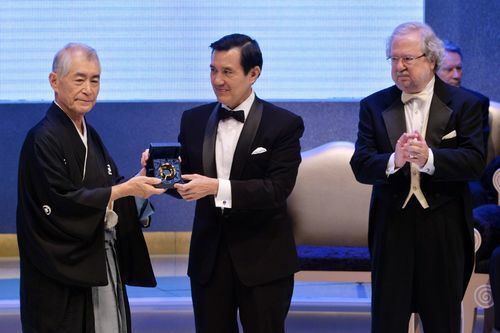 Taipei, Sept. 18 (CNA) James P. Allison of the United States and Tasuku Honjo of Japan shared the first Tang Prize in Biopharmaceutical Science Thursday for discoveries that have helped advance immunotherapy. The discoveries by Allison and Honjo have spurred additional development of therapeutic approaches along the lines of immunotherapy, Kung Hsing-jien, an academician at Academia Sinica, Taiwan's top research institute, said while introducing the two laureates. Praising the two as "giants in immunotherapy," Kung said they have unlocked mysteries and offered new hope in the fight against cancer. Allison and Honjo were honored for the discoveries of cytotoxic T-lymphocyte antigen 4 (CTLA-4) and programmed cell death protein 1 (PD-1) as immune inhibitory molecules that led to their applications in cancer immunotherapy. "I'm pleased to accept this prize not only for myself, but also for those scientists who have labored for decades to achieve the goal of mobilizing the immune system, a successful approach for the treatment of cancer," Allison said during his acceptance speech in Taipei. Recent clinical studies have shown that simultaneous targeting of both CTLA-4 and PD-1 immune checkpoints can be synergistic, and this success has shown that immunotherapy in cancer treatment can be effective, he added. "We're entering an age where we can think of actually curing many types of cancer," Allison said. Honjo echoed Allison's opinion, and urged both the academic and private sectors to cooperate closely. "Interaction between academia and industry should be mutually beneficial," Honjo said. "Academia should expect a reasonable return from industry in order to allow the next generation scientists to nurse the seeds of their latest research." Honjo also singled out the importance of basic research investment, saying that the Japanese authorities' approval in July of PD-1 antibody as a treatment for melanoma came 22 years after the discovery and 12 years after successful trials in animal models. "Long-term investment in basic research is critical to the development of innovative drugs," he said. Honjo, a professor at Kyoto University, discovered PD-1 in 1992, and he later established it as an inhibitor of the T-cell, a type of lymphocyte that plays a central role in cell-mediated immunity. Antibodies against PD-1 have been approved by the U.S. Food and Drug Administration as an investigational drug and are developed for the treatment of cancer. One such antibody is expected to be launched in 2015 for treatment of non-small cell lung cancer and has been hailed by some as having the potential to "change the landscape" in lung cancer treatment. Another antibody is in clinical testing for other types of cancers. Honjo, 72, has received many awards and honors, including Japan's Order of Culture in 2013, the Robert Koch Prize in 2012 and the Imperial Prize of the Japan Academy in 1996. He was elected as a foreign associate of the U.S. National Academy of Sciences in 2001, a member of the German National Academy of Sciences Leopoldina in 2003, and a member of the Japan Academy in 2005. Allison, 66, an immunology professor at the MD Anderson Cancer Center of the University of Texas, is the first scientist to identify CTLA-4, a protein receptor that down-regulates the immune system, in 1995. CTLA-4 is found on the surface of T cells, which lead cellular immune attacks on antigens. Allison's team developed an antibody that blocks CTLA-4 activity and showed in 1996 that this antibody is able to help fight several different types of tumors in mice. The research led to development of a monoclonal antibody drug that was approved by the U.S. FDA in 2011 to treat melanoma. The therapy and a combination of anti-CTLA-4 and anti-PD-1 regimen have been shown to dramatically improve the long-term survival rates of cancer patients. Tang Prize was established in 2012 by Taiwanese entrepreneur Samuel Yin to honor leading lights from around the world in four fields: sustainable development, biopharmaceutical science, sinology and rule of law.